For those whose gospel music election is sure, their journeys carry them through ever changing life scenarios. 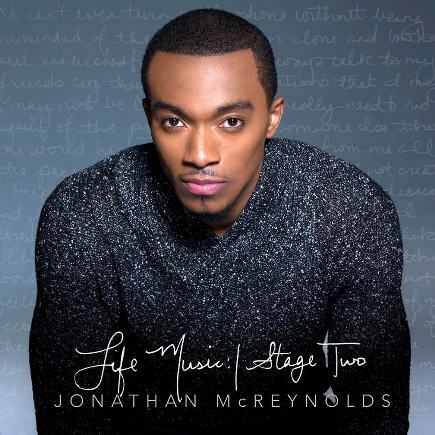 When Jonathan McReynolds recorded his debut album in 2011, Life Music, he was a college student who was breaking into his own artistry zone. Though the messages of preaching nothing less than Christ remains solid on his sophomore release Life Music: Stage 2, McReynolds’ ministry maturity has reflected a secure boldness in handling the daily darts of life with the proper spiritual weapons. His mass audience appeal has brought him to the South by Southwest (SXSW) festival in Austin, TX and the 2015 Essence Festival’s For the Love of R&B Superlounge. Unafraid of becoming vulnerable to share his lessons learned, McReynolds continued reaching beyond the church walls (i.e. performing on BET’s R&B/hip-hop program 106 & Park) with an impressive variety of genres in communicating an uncompromising gospel message. Life Music’s powerful single, “No Grey,” regarding the spiritual consequences of serving two masters, registered highly out of the gate with Billboard #3 Gospel charting and a 2014 Dove Award nomination respectively. One of the singles taken from Life Music: Stage 2, “Pressure,” strives to seek God despite being pulled by the world’s everyday social media demands. Much like Life Music, Stage 2 is driven by McReynolds’ insightful thoughts, adoration of praise and diverse collaborations with R&B vocalist India.Arie, Christian hip-hop artist Derek Minor and veteran worship leader Israel Houghton amongst others. “Got My Love” stirs up a healthy mix of pop, urban and tribal beats: “You got my eye/You stole my heart/You got my love forever for real.” The lead single, “Gotta Have You,” urging those to follow the one who never changes: “Your love is guaranteed in a world of changes,” is cushioned by squishy rhythms. McReynolds considers “Limp” as a sequel to “No Gray.” The nearly unplugged orchestrations with a thumping bass drum encourages those to remind us that all of us have flaws and to striving to be more holy despite our imperfections. “Stay High” that illustrates keeping our head up during troublesome times, embraces a hypnotic hook and melody with a slight reggae break in the middle. It is apparent that McReynolds continues to grow artistically and ministry wise with Life Music: Stage Two. The respect he has already gained with fans of gospel and secular urban markets primarily lies with his open book approach in honestly living his life according to his Christian convictions. Four and a half stars out of five.